Add some sweetness to your day! Peaches are one of my favourite fruits. Paul absolutely loves them. Peach anything, and he’s there. So when one of his co-workers gave him a bag of peaches with the request for a peach pie, Paul’s counter-request was enough peaches to make a second pie for us. Needless to say, we got enough peaches to make two pies, and Paul was extremely happy. I have also realized that I haven’t shared a proper pie crust recipe with you yet, and in order to make a pie, pie crust is kind of essential. Only a little. Either way, I will give you a link to the pie crust that I use, and I promise, I will outline a post on just pie crust soon. I use this recipe from AllRecipes.com. Now, as I leave you drooling over the deliciousness of the above picture, I must go on. 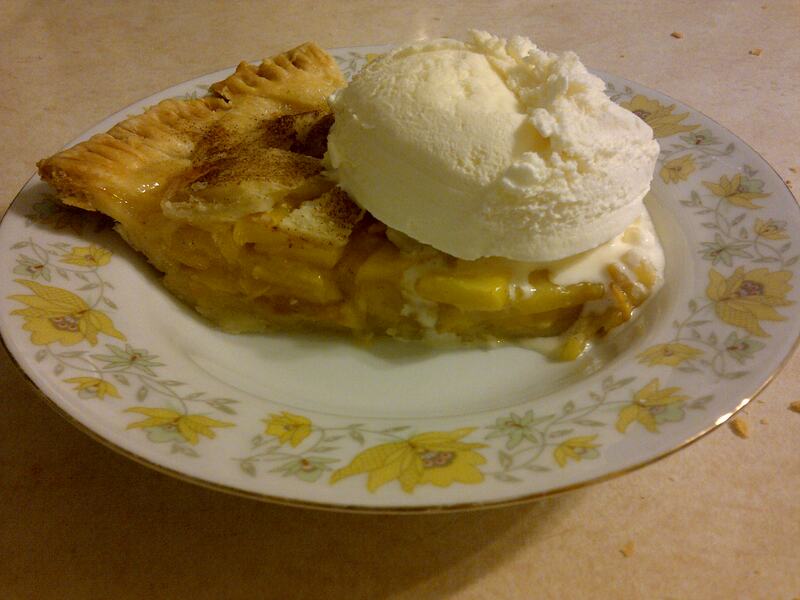 I turned back to the fabulous Annie of Annie’s Eats for her mouthwatering Peach Pie recipe. I have to say, she has not let me down yet. I made a few tweaks, but overall, both Paul and I were extremely impressed with the results. You can’t beat the beautiful colour when you cut into that pie either. Aahhh. This pie is a thing of beauty. Seriously. 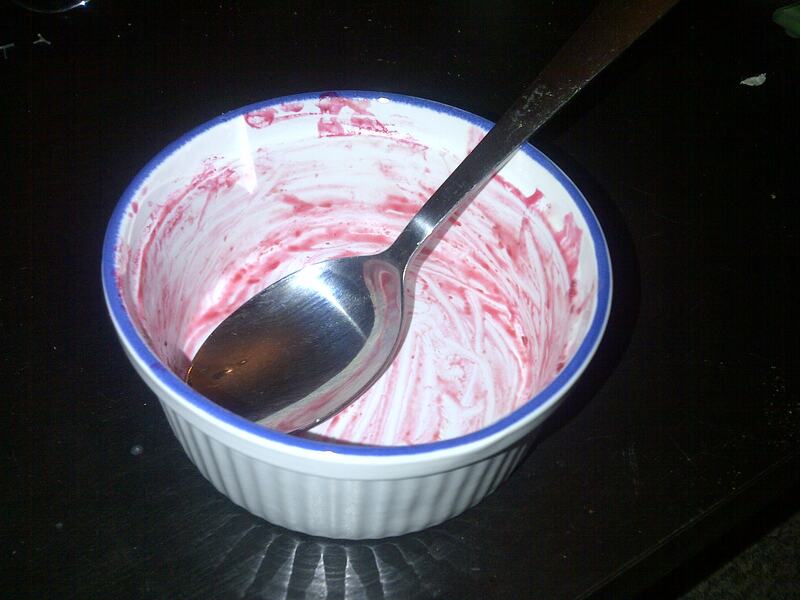 The pie isn’t even gone yet and I’m dreaming about making it again. Preheat the oven to 425°F, and place a baking sheet on the lowest oven rack to catch dripping juices. Roll out half the pie dough so that it fully lines a 9-inch pie plate with some overhang. Trim the edges. For the filling, peel the peaches and slice them to ¼ inch thick slices. In a large bowl, combine the peaches with the sugar, flour, cornstarch and nutmeg or cinnamon. Toss to coat. Add in the lemon juice and rum and stir once more until well combined. Pour the peach filling into the pie crust in an even layer. Dot the top of the peaches with the cold butter pieces. Roll out the remaining pie crust, and cut into strips. 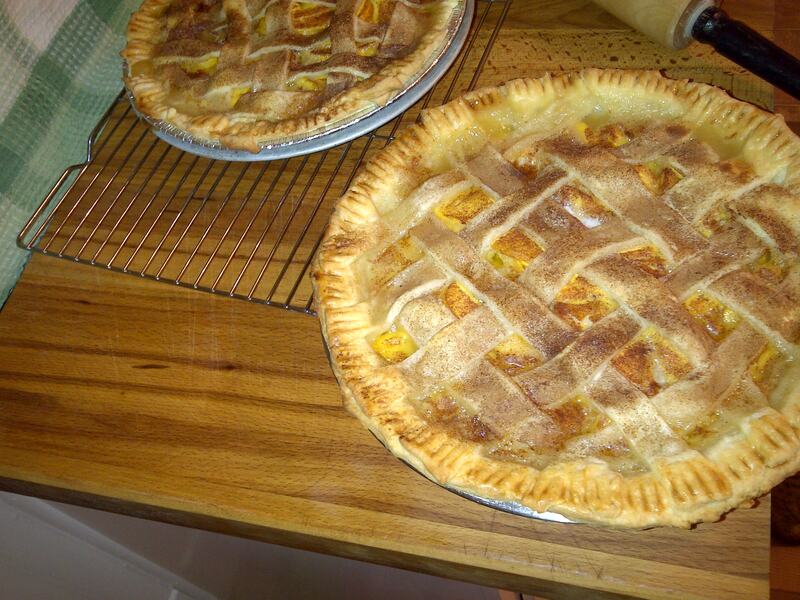 Weave together to form a lattice top, and crimp the edges of the crust together. Lightly brush the top and edges of the pie dough with egg wash and sprinkle with cinnamon sugar. Bake for 20 minutes, then decrease oven temperature to 350°F and bake until the pie is golden brown and the juices are bubbling, about 30-40 minutes more. If pie is browning too quickly during baking, tent the pie loosely with foil. Remove the finished pie to a wire rack and let cool until just warm, about 2 hours. Slice and serve warm with vanilla ice cream. This is definitely a perfect balance between the sweet, tartness of raspberries, and the smooth richness of chocolate, and it combines the best of both worlds in a dessert both fruit and chocolate lovers will approve! 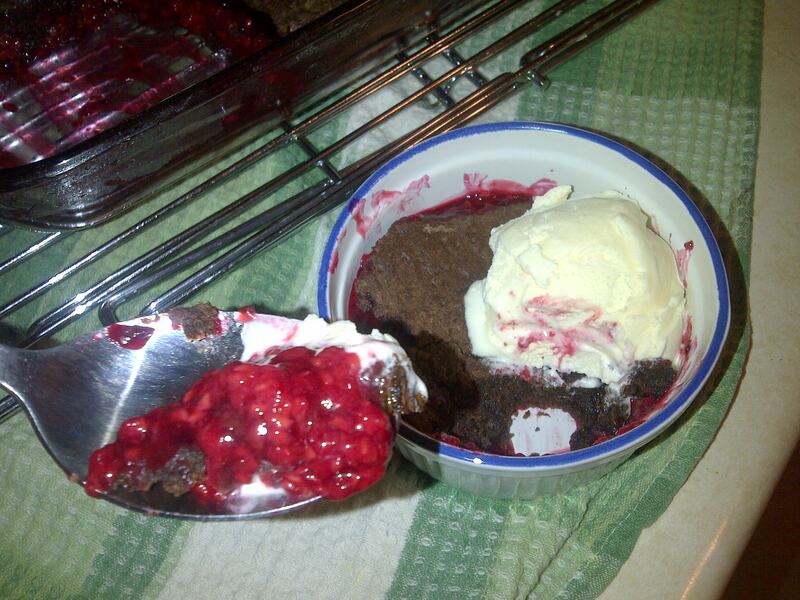 Top the whole thing off with ice cream, and helloooo heaven. The above picture is the cobbler right out of the oven. I didn’t go over-the-top fancy, and cut the biscuits into any shapes, such as in Annie’s cobbler, but I just put the whole thing into a 9 x 13 pan, cut the biscuits into squares and popped it into the oven. Look at that colour contrast though! Beautiful bright red raspberries just make the dessert that much brighter! Do yourself a favour as well. Make sure you eat this with ice cream or whipped cream. The sweet-tart-rich-smooth-creamy flavours and textures just work so well. Take advantage of the summer season and all of the fresh fruit that is available. You won’t be sorry! 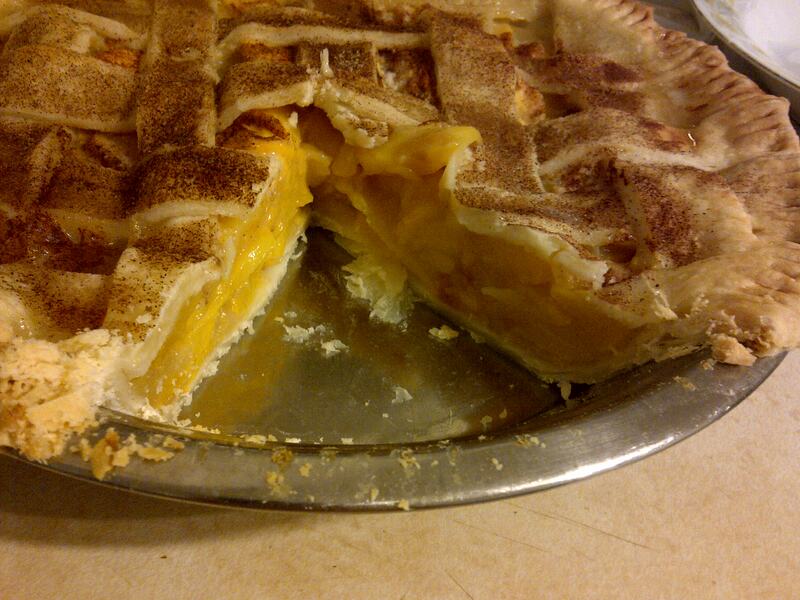 Make sure you also check back in the next couple of days – I have Peach Pie coming your way soon! Preheat oven to 425°F. Lightly grease or spray a 2-2.5 quart baking dish (I used a 9 x 13 pan – which is a little bit larger than required). In the dish, combine all filling ingredients and fold together gently with a spatula until evenly mixed. Bake for 10 minutes without the topping. While the filling is baking, combine the flour, cocoa, sugar and salt in a medium bowl. Whisk well to blend. Cut in the butter pieces in the flour mixture with a pastry blender or two knives. The mixture should be crumbly and the butter should be no bigger than small peas. Stir in the buttermilk and mix gently with a fork until a dough begins to form. (If you do not have buttermilk, use ½ cup milk, and 2 tbsp. vinegar mixed together.) Knead dough together gently until dry ingredients are just incorporated. Fold in the chocolate. Turn out the dough onto a lightly floured surface and pat down into an even layer about 1 inch thick. Either use a cookie cutter to make your desired shapes, or cut into squares. Top the warmed fruit with the biscuits and return the baking dish to the oven. Bake for 15-20 minutes more, until the fruit mixture is bubbling and biscuits are just set and baked through. The juices will settle after resting a few minutes. Serve warm with vanilla ice cream or whipped cream. 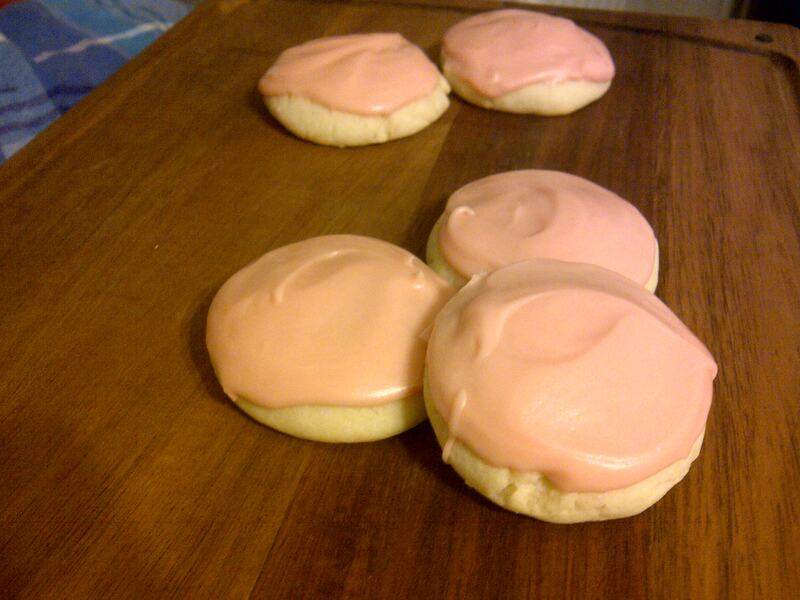 Have you ever had those amazing soft sugar cookies that you can buy in the stores? You know, the ones that they change depending on the season, the time of year, and so on? Well, after trying a bunch of different kinds, my favourite were the orange kinds. The icing tasted like creamsicles, and I’m a sucker for creamsicles. I’ve always wanted to try and replicate those cookies, because if we ever buy a container, they don’t last longer than 2 or 3 days tops. Considering I like to think I’m a fair hand at baking, I wanted to try my luck at these cookies. This is the second time I’ve made these. 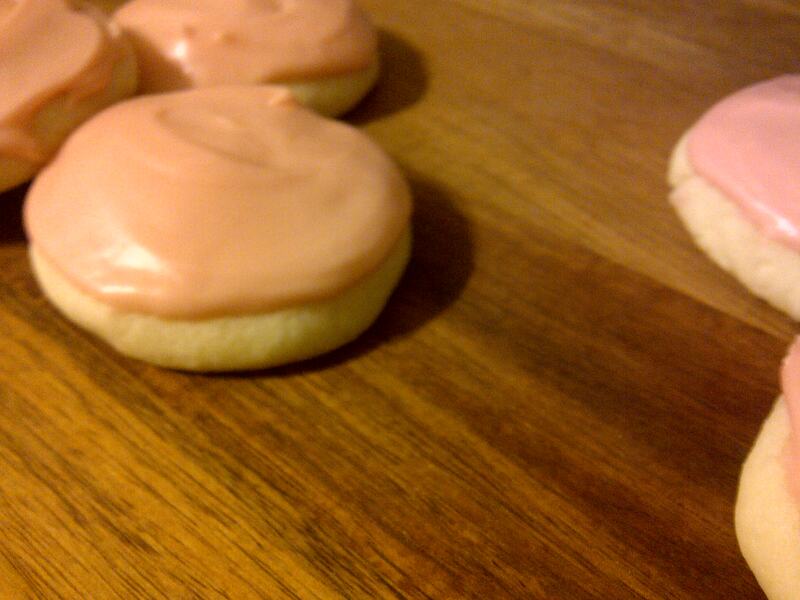 The first time, we definitely made orange icing that tasted just as good, if not better, than the store-bought kind. It was heaven. 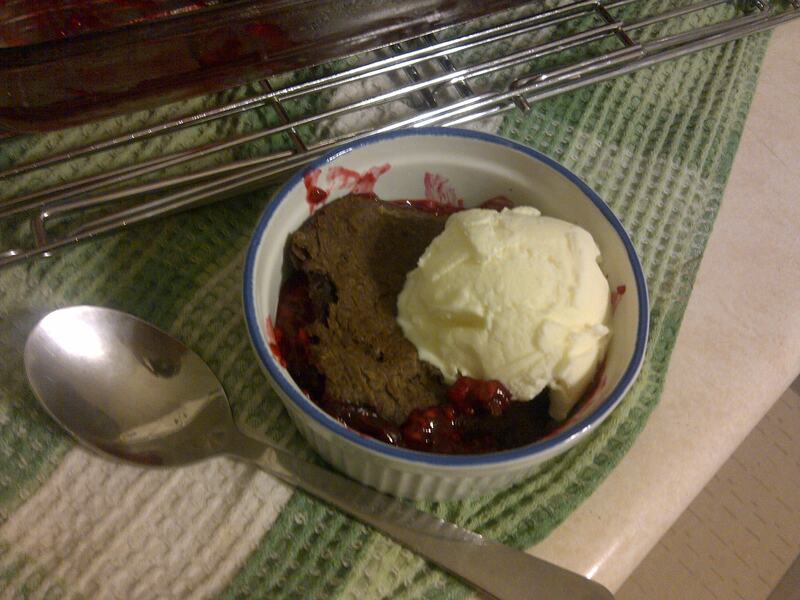 Tonight, I had a baking/dessert craving hit. I couldn’t decide if I wanted cookies, cake, ice cream, or something else, and I turned to Annie’s Eats yet again. I was just browsing around, looking through some archives, and stumbled upon these. Let me just say, it was a good choice. 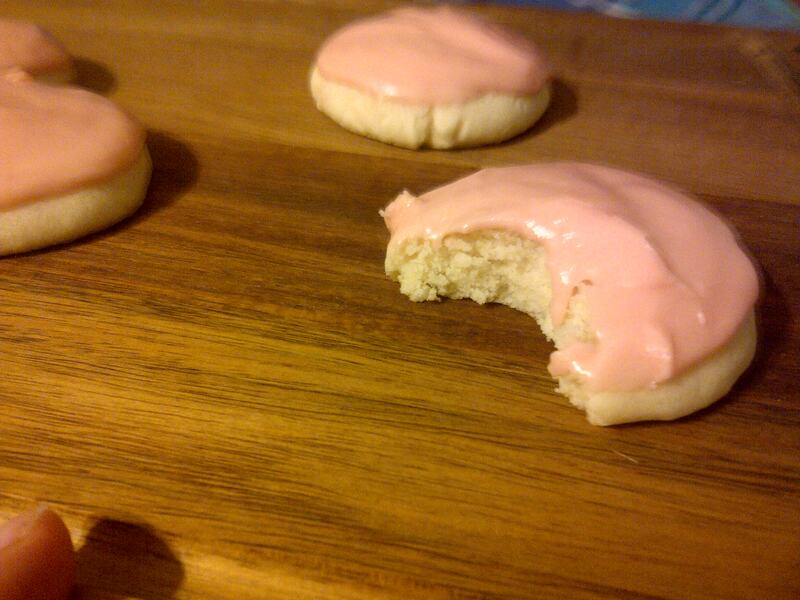 Here’s the link to the Annie’s Eat’s original recipe for Soft Frosted Sugar Cookies. I decided to recreate that fabulous creamsicle flavour, and added orange extract and some red and yellow food colouring to get a soft orange colour. However, you can modify these to suit your tastes and mood. I’ve seen strawberry flavoured cookies, but you could make mint, chocolate, practically anything under the sun! My mom got me some root beer concentrate, and I think next time I make these, I may have to try Root Beer Sugar Cookies! Needles to say, I am quite happy with the results… the cookie is moist and soft, and perfectly complimented by the icing. These are worth the hour long chill time for the dough! Happy summer cookie baking! Line baking sheets with parchment paper or silicone baking sheets. In a medium bowl, combine the flour, baking powder, and salt, and whisk to blend. In the bowl of a mixer, combine butter and sugar, and cream until light and fluffy. Beat the eggs in one at a time, mixing after each addition. Mix in the vanilla. With the mixer on low speed, add in the dry ingredients until just incorporated and evenly mixed. Cover and chill dough for an hour. Preheat oven to 350°F. Scoop out a little less than a quarter cup of dough, and roll into a ball. Flatten slightly, and place on the baking sheets. Repeat with remaining dough, spacing cookies about 2-3 inches apart. Bake for 10-12 minutes, being careful not to overbake. Edges should be lightly browned at the most. Let cool on the baking sheets for a couple minutes, then transfer to a wire rack to cool completely. To frost the cookies, place icing sugar in a medium bowl. Add melted butter, vanilla and milk and whisk until smooth. Whisk in additional milk as necessary until you reach a desired consistency. Tint with food colouring and flavourings as desired. Use an offset spatula or spoon to frost the cooled cookies. If the frosting starts to thicken, add in tiny amounts of milk to keep it workable. Garnish with sprinkles if desired, and store in an airtight container. Ah, plums. I saw some fresh plums at the store today while looking for dinner ideas with Paul, and figured I would make a plum dessert of some kind. 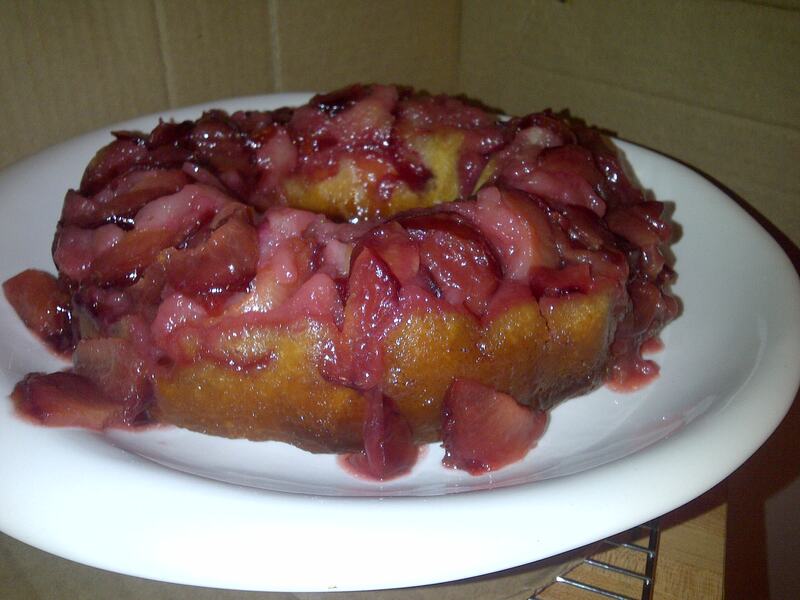 I had in my head a chocolate plum tart, but after looking on Pinterest, I found this upside down cake. Both Paul and I were not disappointed! There is a beautiful sweet caramel-esque sauce that the plums soak up, and the cake is simple yet delicious, flavoured with vanilla, almond extract and just a hint of cardamom. I found the recipe on Red Star to Lone Star, and modified it slightly to account for the plums I had. While Paul and I ran out of ice cream, this cake is best served warm, and while it was to die for as is, I think it would have been taken up a level with ice cream or whipped cream on the side. 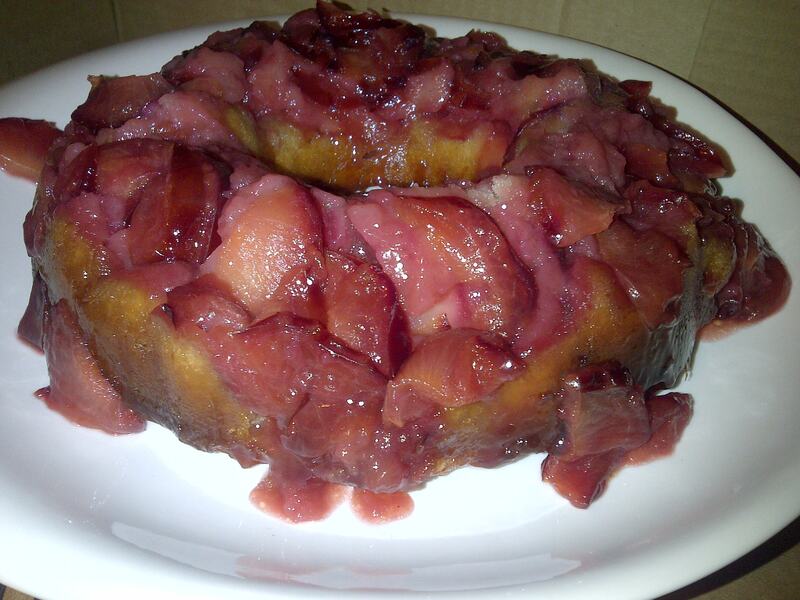 Still, this plum upside down cake was just the dessert I was craving. It is quite simple to make, and the results are awesome. I may have heated our house unnecessarily, but in my opinion (and Paul’s two helpings of positive feedback), it was worth it! Preheat oven to 350°F. Grease a 9-inch pan or a bundt pan. (I used a bundt pan). Mix flour, baking powder, cardamom and salt in a medium bowl and set aside. With a mixer, cream remaining butter and white sugar. Add eggs, vanilla, and almond extract, and whip until fluffy. Add 1/3 of the flour mixture, and mix until just blended. Add half of the milk, and mix until blended. Repeat with remainder of flour mixture and milk, each time mixing until just combined. 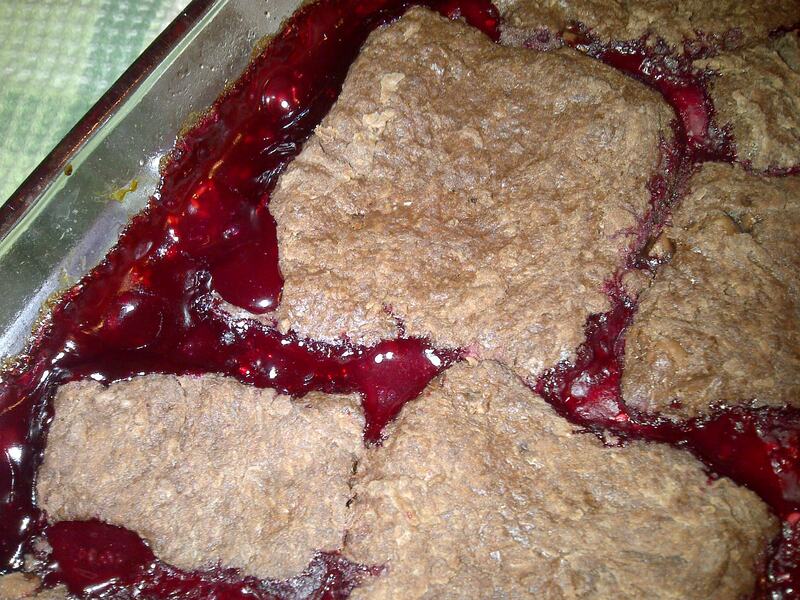 Pour batter over plums, and bake until top of cake is golden brown, about 1 hour. 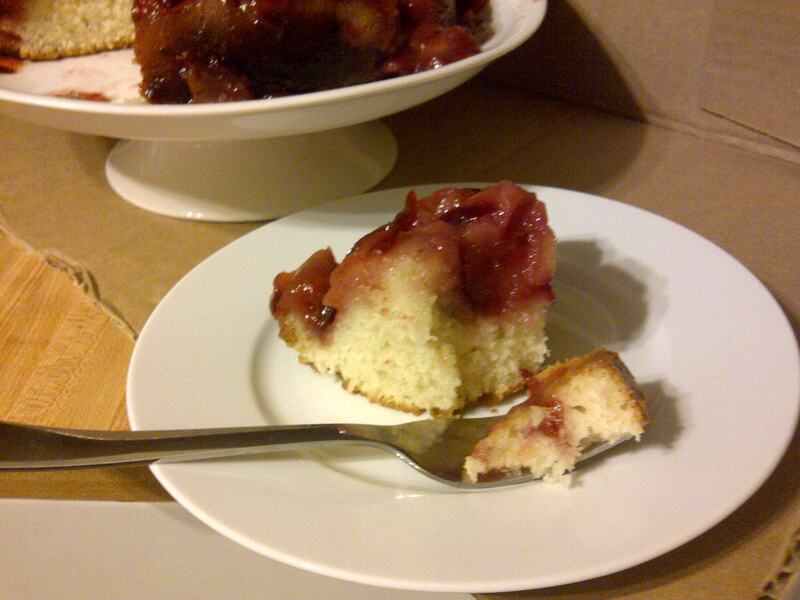 Let the cake cool in the pan for about 15 minutes, then run a knife around the edges and invert onto a serving platter. Serve warm, topping with whipped cream or ice cream if desired. Say hello to a blast from the past! Oh yes. Magic Shell. The wonderful chocolately concoction that turned from liquid to solid as soon as it hits cold ice cream. I never had very much Magic Shell when I was younger, but I have developed an appreciation for it. I have to say, this is one of the easiest things I have made. Ever. Two ingredients. Two minutes. Done. So, so easy. If you are a fan of Magic Shell, or have been wanting to relive your childhood, go make this, and don’t hate me for giving you all such easy and delicious recipes! As a side note, WordPress has changed the format of how I write my blog posts. If things look differently, it’s because I’m in the process of figuring out all of their changes! As such, bear with me, and go bake something, or go enjoy the sunshine! In a microwave safe bowl or measuring cup, place chocolate chips and coconut oil. Heat for 30 seconds, or until all chocolate chips are melted and mixture is smooth. If desired, add flavourings (Paul added Root Beer Extract to make a Chocolate Root Beer Magic Shell). Let cool to room temperature and serve. Store in an airtight container at room temperature. If mixture is too thick, add more coconut oil. If mixture solidifies, microwave back to liquid state.